Our Product Specialist Alex has been looking at how TRACC travel time outputs can be enhanced utilising the Hansen method, this adds additional weighting to the destination and helps provides a different view of how people are travelling. Hansen (1959) developed a gravity-based model measuring accessibility to many facilities for employment, health, and education, etc. from an origin. The use of journey times has traditionally been the preferred method to measure accessibility. While this is a great indicator for showing time to the closest destination, it doesn’t take into account other aspects such as how many destinations can be reached, is one destination better suited than another? Many councils are looking at the attractiveness of destinations for example employment levels and journey times, using the model for weighted outputs developed by Hansen to do so. As a result, this helps councils to determine accessible growth within an area at a more intellectual level. 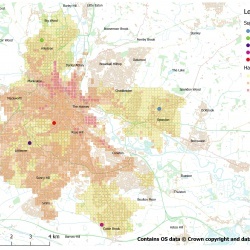 This is done by weighting journey times by population size across the study area and additional destination parameters such as number of jobs, school admissions, university courses, square foot of shop floor space etc. Therefore, providing a different view of how people’s travelling habits are driven. An example of a why an area would get a high Hansen score would be that it offered not only great accessibility in terms of travel time, but also factors such as high employment opportunities and good travel connections for example close proximity to a rail station, thus able to access four destinations within 30 minutes. The essential travel time data that TRACC provides to all the destinations in a calculation can be enhanced by applying the Hansen methodology to deliver more detailed analysis about the value of a location by considering additional external factors. Alex has demonstrated the value of the Hansen method by looking at access to retailers in Oxford and supermarkets in Derby as examples. 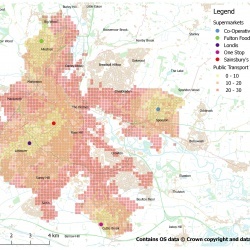 Her report examines journey times to these using public transport and then applies the Hansen weighted method to show the impact of considering external factors on the comparative attractiveness of these retailers/supermarkets for employees and customers or access to potential jobs when looking at the location of a housing development . Read Alex’s full report here.